The short answer is an enthusiastic YES! What follows is not a paid commercial for Ranger Tugs, though it may sound like one. We have seen a lot of looper boats on this trip and are not critical of the decisions made by those owners. The typical boat on the Great Loop is a 30 to 40 foot long trawler and the majority has a fly bridge, twin engines, and are diesel powered. About 20% of the looper boats are 40 to 50 feet long. Most loopers will use marinas because they want to plug-in and use the marina’s toilet and shower facilities. The Ranger 29 is one of the smaller boats seen on the loop but it has been ideal for us. These are reasons why the Ranger 29 is a great Great Loop boat and these are not in priority order. It is tough. The Ranger 29 has the freeboard and the weight to take moderately rough weather safely. For us, we do not go when the winds are a sustained 15 knots or more or the waves are consistently 3 feet or higher. But we have been caught in the Chesapeake Bay, crossing the Potomac River and had 19 miles of 3-4 footers with an occasional 5 footer. Water was sheeting over the cabin and the ride was rough. We crossed the Lake Michigan (also known as Lake Bitchagon) with those steep and tight swells. The tug did better than the crew did. It can fit nearly everywhere. Many loopers will make reservations at marinas at least two to three days in advance. We don’t, and have NEVER been turned away from a marina. 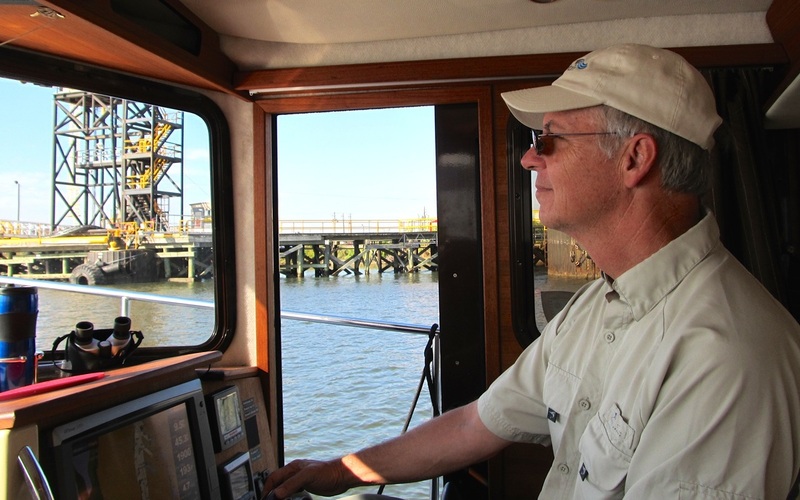 Every marina has found room for a 29-foot long tug with a 10-foot beam and only draws 2’-6. Imagine having the spontaneity to say, “Lets go there!” without the worry of not having a place to go. It’s the draft. With a draft of 2 feet, 6 inches, we have anchored more places, been in some very tight marinas, and at the Jersey Shores, that was reshaped by Superstorm Sandy, the tug was nearly always in single digit waters. Many loopers will avoid the inland waters of the Jersey Shore and stay “outside” on the Atlantic with a stop at Atlantic City before going to New York. In nearly 5,000 miles, the tug has never run aground. Many times, the marked channels can be very narrow and the tug’s draft simply gives more versatility and piece of mind. We have inadvertently cut buoys, wandered off the channel, and failed to pay attention to the tide. The draft of the Ranger 29 provides a more forgiving cruising time. The propeller is protected. A common story told by loopers is hitting the submerged log or hitting a rock that bends the propeller and may cause more serious damage. The cost of this repair can be in the thousands and may take many days in a boatyard. The Ranger 29’s propeller is completely behind the keel and the rudder is no longer than the keel and this provides a high degree of protection. We have bumped objects that are below the surface but no damage occurred. It’s the air-draft. The height of the Ranger 29 with the antennae down is 13 feet and we have been able to go under many bridges without asking them to be opened. Many of the larger and taller boats miss out on great sights because they cannot fit under the bridges. Downtown Chicago is a classic example. Imagine 24 bridges in 5 miles and boating in a highly evolved urban setting; the Ranger 29 can do that. Also, some bridges open only on a schedule and we have not been restricted by those schedules. It is economical. Boating is expensive and an inefficient way to travel. 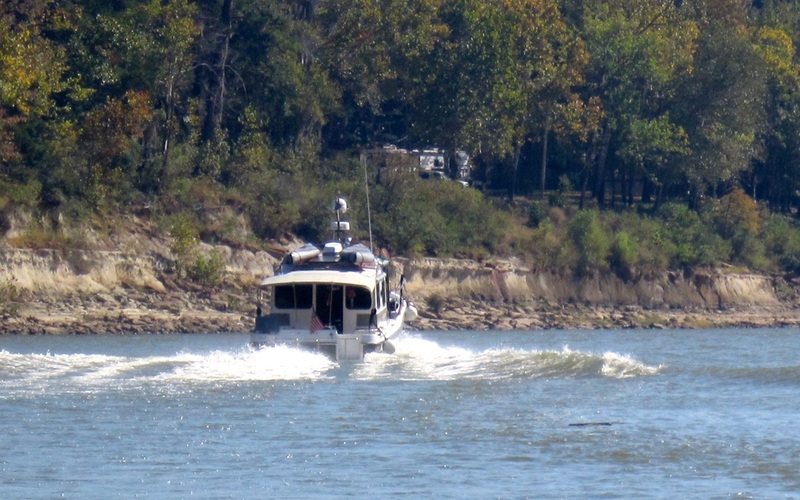 Many loopers are envious of the Ranger 29’s fuel efficiency of 4 miles per gallon at the slower cruising speed of 8 miles per hour with its single diesel engine. At this speed, the tug burns 2 gallons an hour. A six-hour day will cover 48 miles, use 12 gallons or only 10% of the tug’s fuel capacity. The high speed cruising speed of 13 to 14 results in 1.5 miles per gallon and that is better than most traditional looper boats. The economy is more than just fuel; it is also marina fees and maintenance. Marinas charge by the foot, ranging from $1 to just under $3 a foot. The typical 40-foot trawler will pay $40-120 a night, while the Ranger 29 will cost $29-90 a night. It is also about the need for AC power. Andiamo’s house batteries can easily provide 3 days of power. Normal and typical engine maintenance is easy because of the ease of access. Many owners do their oil and filter changes and buy those parts from the factory’s service department at an additional savings from retail. It is movable. We live in the Seattle area and had the tug trailered to Florida on a triple axle boat trailer that was pulled by a 1-ton pickup truck. Many Ranger 29 owners tow their tugs because it is do-able. Movable means that tug can be moved out of harms way, like a hurricane or an obstacle, such as when a river is closed for three weeks due to flooding. When a trip has to be cut short, rather than storing the boat hundreds or thousands miles away from home, it can be moved home. Should something catastrophic happen to the tug, rather than being at the mercy of a local boatyard, it could be moved to a place that is more comfortable. It is safer to move about with almost no stairs. A common issue with loopers who are in multi-story boats is the climbing and descending stairs that can be narrow, awkward and must be done quickly when docking or locking. Imagine scurrying up and down several flights of stairs for each lock and on one part of the loop, 12 locks are done in one day on the Trent-Severn Waterway. Steps are an opportunity to trip and fall. The Ranger 29’s only step is down to the master berth and head. Getting to the critical areas is easy and quick with little chance of an injury. It’s a conversation icebreaker. We call it Andiamo Mojo and it happens nearly everyday when people stop and stare at the tug. At the dock, nearly everyday there is a conversation about the tug that is started by a visitor. The tug is a great way to meet people; they will come to it. It is simple. Doing the loop is an adventure; if it was not an adventure, every boater would do it but only about 200 or so a year do the 6,000-mile trip. Like every cruising boat, The Ranger 29 is a set of complex systems; water, sewer, electrical, navigation, propulsion and the living features. However, the engineering and the technology make it simple to use and maintain. It is easy to handle in tight places and at low speeds. The true skill of handling a boat is not at high speeds but rather at idle speeds and in tight places. Many marinas are very small and transiting locks require skill and confidence to snug the tug against very hard and damaging surfaces when people are watching. The throttle controls with fly-by-wire and the hydraulic helm are very responsive. The bow and stern thrusters are great for fine-tuning the final approach. The visibility from the helm and nearly the entire tug is stunning because there are no blind spots. We are rarely intimidated by docking and typically do not need or ask for assistance because it is safe and easy. The side door on the starboard side makes going through locks so easy because the operator can easily handle lines without leaving the controls. Enjoy the good life in a great living area for two. We easily do 30 to 100 mile days because the tug is so comfortable. Underway at the slow cruising speed, the engine noise is minimal allowing for easy conversations or listening to the iPod or satellite radio. Fresh bread, cookies and assorted treats have been baked while underway. On cold and rainy days when others are bundled up and on the cockpit or flybridge, we are snug and warm in the pilothouse. At the marina or at anchor, the shower is easy and comfortable, drinks in the cockpit, dinner and reading around the spacious table on fine upholstered seats and surrounded with fine wood. Often, the evening is closed with a movie or watching TV. Power when you need it. The 260 HP engine has the capability to take you places faster; especially, when the weather is turning, when there is a tow and barge to pass, when the rough sea conditions need to be done with, and when the river current below a dam will slow every other boat to a slow crawl. 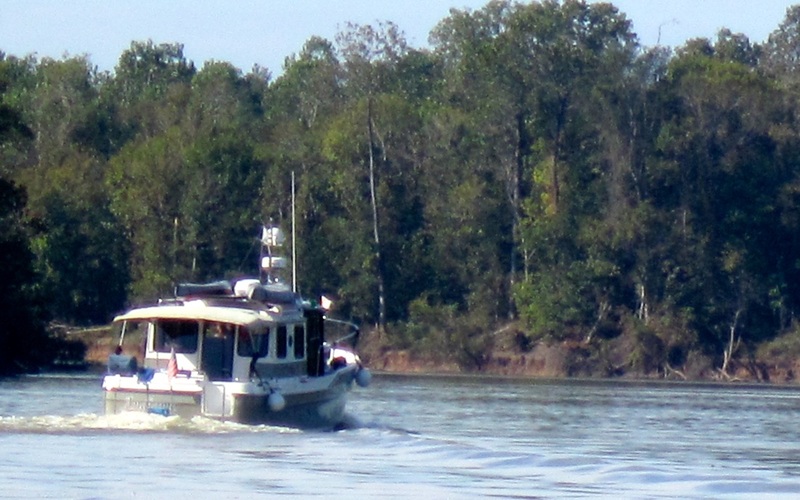 The pilothouse makes long cruising days very comfortable. We were sailors for 10 years and respect those who sit in the wind bundled up coats and hats in August. We had a fast cruiser for 10 years and have bounced and skimmed, holding on to grab rails to “just get there.” The pilothouse makes cruising easy, safe and comfortable. Being out of the wind, out of the sun and with all the instruments and the creature comforts, is part of the joy of cruising. We do not miss a flybridge because ladders create the potential for falls and being in the lower center of gravity of the tug is more comfortable when the water is causing the tug to pitch and roll.